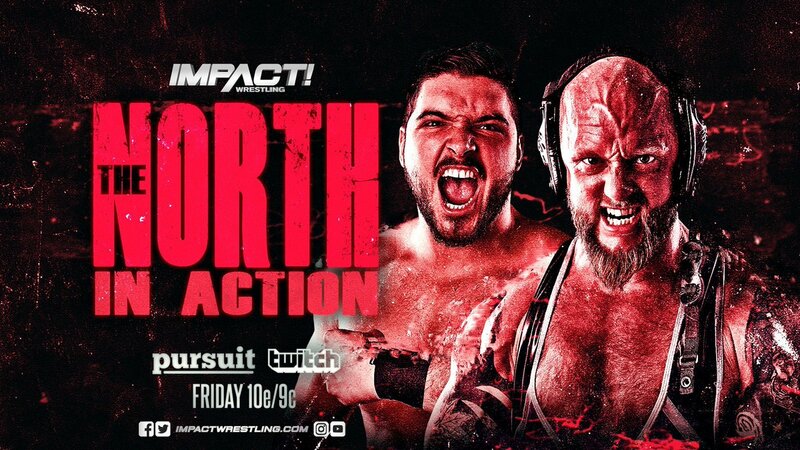 IMPACT kicks off with the OGz and LAX brawling backstage. The brawl goes all over the place and everything is being thrown at each other including hangers. Security finally shows up to stop Hernandez from dropping Santana over the stairwell railing but they get beaten up and the show finally starts. Gama Singh is in the ring and introduces The Desi Hit Squad as they come to the ring for the match. “The Bone Soldier” Taji Ishimori makes his way out to the ring and followed by his partner Petey Williams. The bell rings and here we go. Gursinder gets the advantage on Taji by hitting him with a kick but Ishimori fights back and makes it yo the apron and takes down Gursinder. Williams tags in and hits a slingshot codebreaker on Gursinder. Rohit comes into the ring to save his partner but gets taken down by Petey. Williams then hits a low dropkick senton maneuver on both guys. Gursinder fights back and gains conteol of the match. Rohit tags in a they irish whip Williams and as he comes off the ropes Gursinder hits a low dropkick on his knee and Rohit stays on the attack. Rohit brings him to his corner and tags in Gursinder. Gursinder wears down Petey in the corner then tags back in Rohit. Rohit brings him to the center of the ring and hits a front face slam on Petey. Rohit then drags him back to his corner but Petey fights back out of the corner and takes out both guys allowing him to tag in Ishimori. 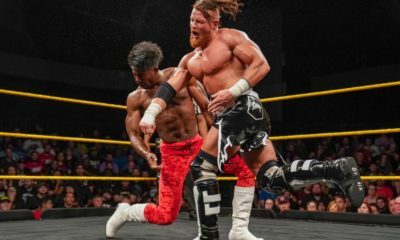 Taiji hits a huge missile dropkick on both men. Taji stays on the attack but Rohit is able to fight back and regain control of the match abs sweeps the legs of Taji. Rohit then follows up with a double stomp to the chest. Petey comes in to help Taji and looks to hit the candian destroyer but to no avail. Gursinder would take out Petey and Rohit stays in control but down the stretch Petey is able to hit the Canadian Destroyer and Taji hits a modified DDT for the win. 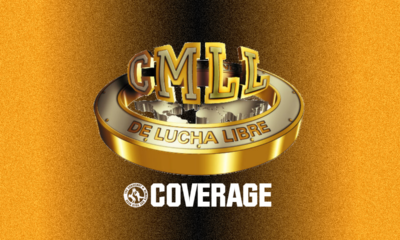 We hear from Pentagon Jr eho says that Matt use to be a chsmpion but no he is not and questions everything including the universe. Pentagon says he is going to take Matt to his universe and the only thing that exist is pain. Allie and Keira are interviewed backstage and they are talking about how Allie pinned Su Yung to win the tag match last week. The interviewer talks about how Tessa atfacked her after the match. Allie says that all she wants Su Yung she doesn’t care if its a non-title match. Allie promised to take out Su and Keria says that Su can bting all the bridesmaids and Tessa can join the party too. They say that Su’s time is up. 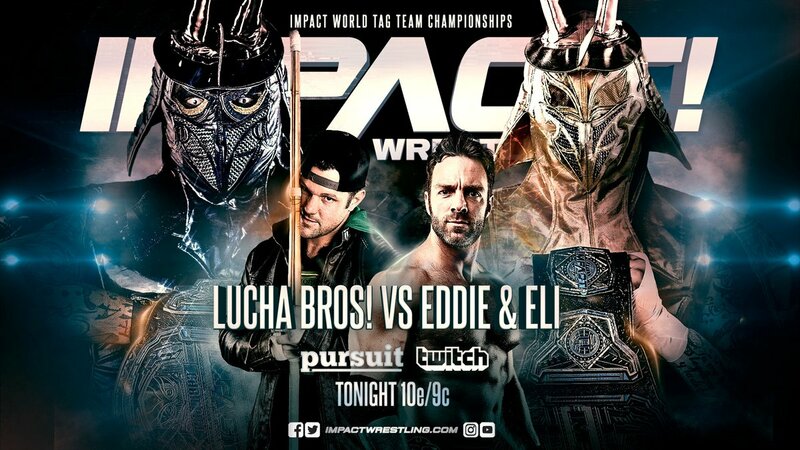 We see a video package showing the transformation of Eddie Edwards into who is today and how we got to this world title match tonight between him and Austin Aries. Austin Aries is interviewed backstage abkut his world title match tonight against Eddie Edwards. Austin Aries calls Eddie a carzy man carrying a kendo stick. He says that he has known Eddie for ten plus years. He wishes that he was wrestling the old Eddie tonight even though he is still better he says tonight’s match is going to be unpredictable and dangerous but he is still going to come out on top. 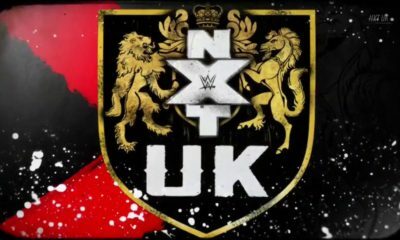 We see Grado, Joe Hendry, and Katerina backstage amd talk about what happened during their tag match last week. Grado asked if they were hugging and that’s why Joe couldn’t make the tag. Katerina says she was protecting Joe. Katerina then asked if he can’t beat Rli on his own cause Joe did. They then make up and leave together. Alisha Edwards makes her way tk the ring for the match. Tessa then makes her way tk the ring for the match. The bell rings and here we go. Collar and elbow tie up and Tessa pushes her tk the corner. Alisha fights bsck and lays in the forearms but Tessa fights back and knocks her into the ropes. Tessa then hits Alisha with a gorilla press. Tssaa stays on the attack but Alisha fights back and hits a couple of forearms and hits the ropes but hits checked by Tessa and hits her with a tilt a whirl backbreaker. Tesa then hits a suplex for a nearfall. Alisha fights bsck and gets a crucfix pin on Tessa for a two count. Tessa is done playing with Alisha and hits her with a couple of forearms to the back and takes her down for a two count. Alisha tries to get away but Tessa stays close to her and hits her with a knee to the gut. Alisha is able to escape and get Tessa’s arm caught on the ropes giving her some space. Alisha stays on the attack and hits a flatliner and both knockouts are down. They both eventually get back up but Alisha stays on the attack into a bulldog for a two count. Alisha still fighting and takes Tessa down for another nearfall. Tessa then fights back and grabs Alisha and hits a slingshot spinrbuster leading into the hammerlock DDT for thr win. Aftet the match Tessa grabs a mic and says she just made an example of Alisha. She says that Allie may have everyone else fooled but not her. She says that the only thing Allie cares about is the knockouts championship. 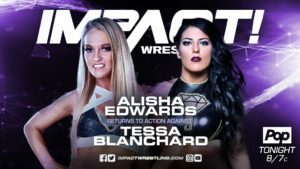 Tessa says if Allie is going after Su and the knockouts championship then she is coming for her. 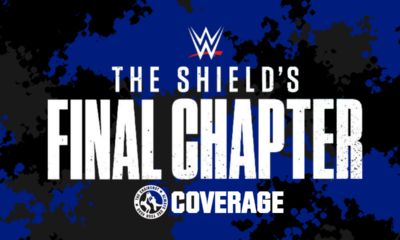 Matt Sydal was interviewed backstage and ask him about his match tonight. Matt says that he may have lost the belt and the material piece but he still has the spirt of the X-Division Champion. He says he is going to use that to beat Pentagon Jr tonight. He says that he is going to get everyone tuned in and turned on and open our third eyes. We see KM and Fallah Bahh backstage and they talk about what happend last week. While they were arguing they run into Scarlett Bordeaux who says their looking good. KM and Fallah Bahh are mesmerized by her. 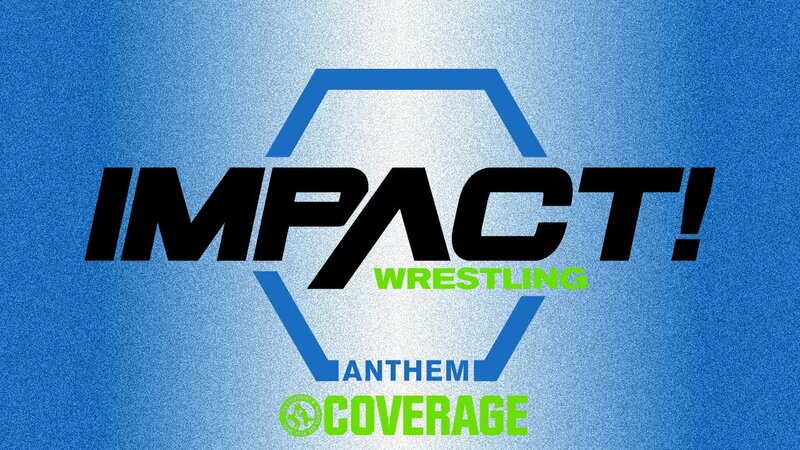 Back from break and we see Scarlett Bordeaux meeting with IMPACT Mangement. She says the girls are mean to her and doesn’t feel safe getting in the ring with her. They give her own show call it the smoke show. They call her one of a kind. Matt Sydal makes his way to the ring for his match. Pentagon Jr makes his way to the ring for the match. The bell rings and here we go. They jaw jack for a while and Sydal tells Pentagon to open his third eye. Sydal then takes Pentagon down to the mat and begins to wear him down. Pentagon fights back and takes down Sydal with a huge kick to the chest. Pentagon then attacks the reconstructed knee of Sydal. Matt gets back up and props himself up in the corner but Pentagon stays on the attack attacking all the joints of Matt. Pentagon then kicks Sydal on the side of the head then rolls him up for a nearfall. Sydal then regains control of the match and attacks the leg of Pentagon. Sydal continues to tell him to open up his third eye and that he isn’t afraid of him. Pentagon fights back and hits two slingblades on Sydal. Matt is able to escape and slide under the ring. Matt comes out on the other side and lures him to the floor and takes him out with a running knee. Sydal stays on the attack and focuses on the legs and knees of Pentagon. Pentagon is still on the ground and Sydal stays on the attsck and tells Pentagon that he is fearless. Pentagon fights back and hits a superkick on Sydal then eats a huge chop. Sydal fights back and hits a running knee on Pentagon off the apron with his reconstructed knee as we go to break. 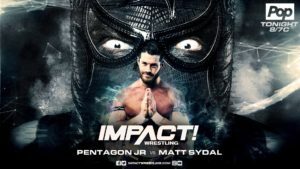 Back from break Sydal is in control and goes to the top but gets caught by Pentagon. Sydal fights back and nails Pentagon with a spinning heel kick for a two count. Sydal sets Pentagon innthe corner and looks for the mount by Pentagon slides out and knocks him down and takes him out for a two count. Pentagon then looksto try and break Matt’s arm but Sydal escapes snd takes fown Pentagon for a two count. 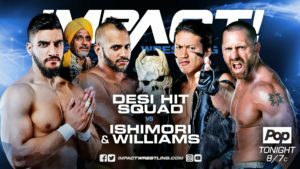 Sydal grabs and picks up Pentagon but he counters and hits a big chop and they trade and few chops before Sydal catches him with a knee then Pentagon regroups and hits the Pentagon Driver for a two count. Sydal is in control and forces Pentagon into the corner snd hits a big splash to the back. Sydal then looks to hit the shooting star press but Pentagon gets the knees up and rolls him up for the nearfall. Pentagon then hits the fear factor for the pinfall victory. After the match on the titantron we see oVe and Sami is sicknof losing and says there will be some consequences. He says he looks like and idiot and people are talking about him online. Sami says one of them has to get their head shave. They both refuse but Sami choses Dave and makes Jake save his head. Sami says they are looking more like a family. Back from break and LAX and Konan make their way to the ring. 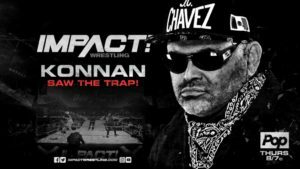 Konan talks about how they beat the OGz at Slammiversary in a 5150 street fight a match they are undefeated in. The OGz appear and King says they don’t tell them watch to do. Konan calls him names but King says all they do is tell jokes while they have their titles. King admits that it was a setup. King wants this to be taken to the concerte jungle and ask if Konan is scared. Konan says that he made them who they are and says that their is only one group that runs the streets and that’s LAX. We see Eddie Edwards backstage with his kendo stick and says it’s time to play. Eddie Edwards makes his way to the ring to challenge for the world championship. Austin Aries makes his way to the ring to defend his world title against Eddie Edwards. The bell rings and here we go. Collar and elbow tie up and A u.k stin Aries gets the advantage for a bit with a sideheadlock and Aries stands tall showboating. Back and forth with go and Aries gets caught with an overhead belly to belly suplex. Eddie then lays on the canvas making snow angles. Eddie then chases him looking to shake his hand. As we go to break we see Aries trying to getback in the ring but Eddie walks up to him still trying to shake his hand. Back from break and Eddie Edwards is still holding the ring with Aries on the outside. They finally lock up again but Aries gains vontrol and boxs the ears of Rddie then looks to go for a suicide dive but gets caufht by a foream frkm Eddie. Eddie is in control and attacks Aries with multiple chops. Eddie rolls back in the ring to break the count. Aries begins to stumble away but Eddie follows him back in the ring. Aries looks for a brain buster but Eddie counters intona front face slam. Aries fights back and sends Eddie to the floor and finally hits the suicide dive. Aries brings Eddie back in the ring for a two count. Aries then floats over and takes down Eddie again for a two count. Aries then hits a huge chop on Eddie but Eddie enjoys it and ask for more. Aries looks to hit another chop but gets caught and Eddie hits him with a blue thunder bomb. Back and forth we go and Eddie gets the advantage and hits Aries with a tiger driver for a two count. Aries fights back and locks in the last chancery but Eddie bites his fingers to escape the hold. 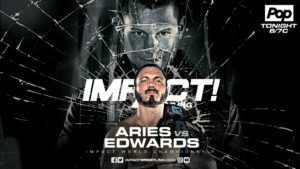 Aries is mad now and looks to hit Eddie with the belt but the referee stops him which allows Eddie to hit a lowblow on Aries and roll him up for a two count. Things break down as Eddie accidentally hits the referee with a spin kick. Eddie then takes out Aries with a DDT and goes for the pin but the ref is still down. Eddie grabs the kendo stick and hits the referee. Aries then looks for the brain buster again but Eddie counters and hits him with the kendo stick. Eddie then begins to choke out Aries in the corner. Killer Kross comes out and hits doomsday on Eddie then Aries hits the brain buster on Eddie for the pinfall victory. Killer Kross lays the calling card on Eddie. Aries and Killer Kross stand tall to close the show.